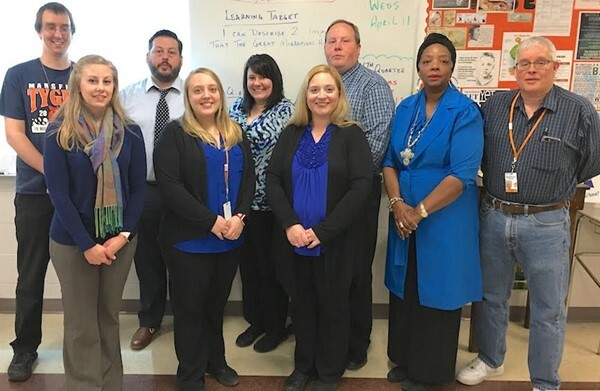 Teachers in the Freshman Academy at Mansfield Senior High School wore blue on Wednesday to call attention to April as National Child Abuse Prevention Month. The Freshman Academy at Mansfield Senior High School will join Richland County Children Services for an in-school rally on April 18 to combat child abuse, bullying and other issues that impact school safety. Students, teachers and parents will participate in the event from 10 to 10:50 a.m. in the auditorium. Speakers will include Mayor Tim Theaker, Police Chief Ken Coontz, Mansfield City Schools Superintendent Brian Garverick, Freshman Academy Principal Andrew Schiefer, a freshman parent and Patricia Harrelson, Children Services executive director. Child Abuse Awareness Month was the focal point of a Wear Blue Day rally Wednesday at Graham Auto Mall in Mansfield. Tim Harless, Children Services director of community outreach and programming, told local media that the annual event is a way to let the community know that the agency is available 24 hours a day, every day of the year. Children Services has reported that it assessed 1,670 allegations and requests for services in 2017. At the end of the year caseworkers had 389 open and ongoing cases involving 773 local children.